kAsiniyIr – Oh those on this earth! rOhiNi – and star day of rOhiNi. Now, since after the star day of kArththikai it is rOhiNi, and since the month of this AzhvAr is also of kArththikai, for that sequence, and since the day of rOhiNi in kArththikai month is when thiruppANAzhvAr incarnated, it is loved by those who accept the vEdhas (Asthika) and is celebrated, says maNavALa mAmunigaL. kArththikaiyil rOhiNi nAL kAnmin inRu kAsiniyeer – He advised to his mind in the previous pAsuram, and in this again he is advising to the common man of the world (loukikar), with the wish in his mind that they (we) would be agreeable and go along with him. rOhiNi nAL – is the star day that krishNan incarnated. This AzhvAr is having his mind attracted to that krishNan, “kOvalanAi veNNai uNda vAyan en uLLam kavarndhAnai [amalanAdhipirAn – 10]” (as a cowherd, ‘mouth person’ having the butter he ate; one who stole my heart..). So, his star day also became that itself. Not only that, thirukkOttiyUr nambi from whom the meanings of charama slOkam started to spread, also incarnated in rOhiNi star day in the month of vaikAsi (vaisAkha). As is said of him ‘uRiyil veNNaiyOdu iyaluNda oruvanaip pOl avadhariththAr’ (incarnated like one who along with butter from the sling, ate the iyal (prabandham?) as well), so (since all three are related to krishNan), this is of muppuri (all three auspicious events happening in similar fashion). When is this triple special day? inRu kANmin – it is today, see this, you all! Not some other day, like said in ‘ayam mAsa:’ (ayOdhyA kANtam 3-4), it is today! He (maNavALa mAmunigaL) is having extreme love, that even though it (incarnation?) was in the past, he is saying it as present day. Like one would show huge stash of money, he is showing it as if it is in the front, saying, see this (day)! kAsiniyeer – showing it not for one or two persons, but like said in ‘yadhi kaschin mumukshu: syAth’ (if there is any mumukshu present..), due to his love, he is preaching to the whole country. Would you not explain the reason for this day’s greatness? 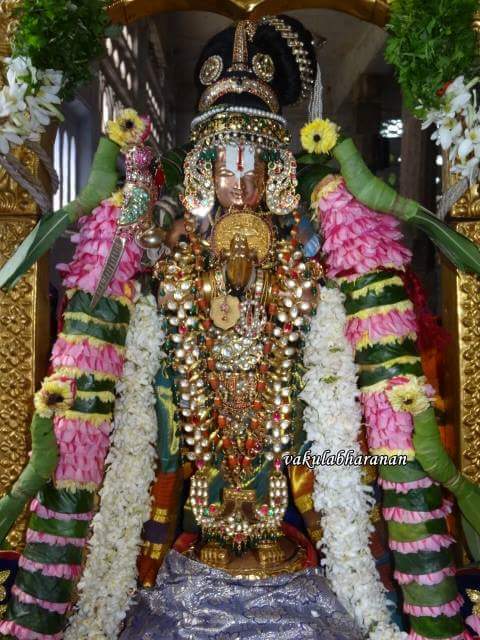 He replies: vAyththa pugazhp pANar vandhu udhippAl (due to incarnation of thiruppANAzhvAr who is having apt glory) – vAyththa pugazh is – glory that matches the svarUpam (nature); that is, having the humbleness that is required to match being naturally subservient, is present in him as part of his birth (in fifth varNam), and so (emperumAn) making srI lOka sAranga muni carry AzhvAr by head as his vAhanam (vehicle/carrier), and accepted AzhvAr – having such glory. It is said – ‘pAriyalum pugazh pAN perumAL [rAmAnusa nURRanthAdhi – 11]’ (~ his glory and auspicious quality have spread in the world, such thiruppANAzhvAr). pANar vandhu udhippAl – Similar to what is said in ‘Ethath sAma gAyan nAsthE [thaiththiriya upanishath – bruguvalli – 10) (he is reciting/singing sAma vEdham) which is the action of mukthas (those in parama padham), here AzhvAr is doing the services with his pAN type songs to periya perumAL; and doing that is his identity. thiruppANAzhvAr at uRaiyUr during his yearly star day (thirunakshathram day)! nangudanE koNdAdum nAL – they would be trustful of such pramANams, be Asthikas, be motivated by its instructions, think about them as helpful for the well-being, and celebrate that day (of AzhvAr’s incarnation). So maNavALa mAmunigaL says (to us) – you too be Asthika, and trust my words, and establish these in your mind. This entry was posted in Other, upadhESa raththina mAlai and tagged 74, alwar, amalanadhipiran, annan, erumbi, erumbiappa, kovil, lokasaranga, mamunigal, manavala, muni, nambi, panan, panar, pasurams, periya, perumal, pranavan, rathina, rathinamalai, raththina, raththinamalai, saranga, thirukoshtiyur, thirupanalwar, thirupanazhvar, upadesa, upadhesa on December 12, 2015 by raghuram.